When Diwali/Deepavali holiday in telangana/ andhra pradesh , diwali holiday date, holidays in telangana, holidays in andhra pradesh, deepavali festival when, celebrations of diwali in telangana state TS GO. 2139 Deepavali/Diwali General Holiday on 19-10-2017 instead of 18-10-2017 and Naraka Chaturdhi Optional Holiday on 18-10-2017 instead of 17-10-2017 wide G.O.Rt.No. 2139 Dated: 16-10-2017. 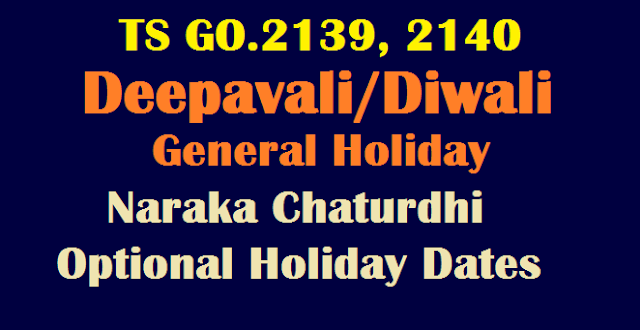 Declaration of Optional Holiday on 18.10.2017 (Wednesday) on occasion of ‘Naraka Chaturdhi’ instead of 17.10.2017 (Tuesday) and General Holiday on 19.10.2017 (Thursday) on account of ‘Deepavali’ instead of 18.10.2017 (Wednesday) –Amendment – Orders – Issued.